If you like value for money and superb comfort then the Nectar mattress is going to be for you. Firstly you get a 365-night trial. A WHOLE YEAR! You can sleep on it for a full year before you have to make up your mind on whether it’s for you or not. Excellent value. And it’s got 7-zones of support across the whole mattress giving you the maximum support you need up and down your back so you can sleep soundly and wake up refreshed. Click this link to visit Nectar sleep and get £100 off your order! Let’s get the hood open and see what’s inside! Every great mattress starts with a proper cover. And the Nectar Mattress cover is really clever, it actually has a special material in it that can adapt to your body temperature, so it cools you when your hot and warms you when you’re cold! Plus it works only where it’s in contact with your body so you’re partner will have their own comfortable little ecosystem to sleep in. Again the cooling comes into play. One of the big problems of memory foam is that it traps in a lot of heat and can be really uncomfortable, I’m sure you don’t like waking up all sweaty right? Not with the Nectar mattress. This layer of cooling foam is 30x more breathable than other premium memory foams keeping you cool and comfortable all night long. The all-important memory foam layer which keeps you supported through the night. Your back gets cradled and you gently sink in getting the gentle hug of your bed while you lie on it. Now this is really cool, you get 7 zones of support across the mattress. This means firmer support where you need it, at your hips and shoulder, softer support at your head and feet and nice medium support in your knees and middle. Ideal across your whole body and really good if you have any back problems or tend to wake up feeling stiff in the morning. Loads of things! But I’ll keep it limited to my favourite few. Nectar mattress are the first and only mattress company to offset all their carbon emissions which is really awesome. A mattress is a big item and I’m sure I’m like you and want to do good for the environment. You get free delivery, 48 hour delivery time and it comes in the cool box that lets you just roll it out and unpack it. 1000 Sold A Day In The US! Not normally something I’d look at…. But, if that many people are happily sleeping on it, it must be pretty good right? Yup, like all memory foam mattresses th Nectar Mattress comes with a bit of a weird smell when you first unpackage it. It is totally normal and goes away after a few days. If you can leave it to air uncovered for a few days great but if you need to use it straight away (I know I would) then the smell still goes away it just takes a couple of extra days. But after a week you’ll hardly notice and after a few weeks it will be fully gone. Medium-Firm Feel – People looking for a Medium-Firm feel will absolutely love the Nectar mattress. Couples – The memory foam cushions movement so you don’t feel your partner move around and the cooling cover works perfectly for couples. Hot Sleepers – The cooling layer and breathable cover make this an ideal choice if you’re prone to overheating in bed (like I am). 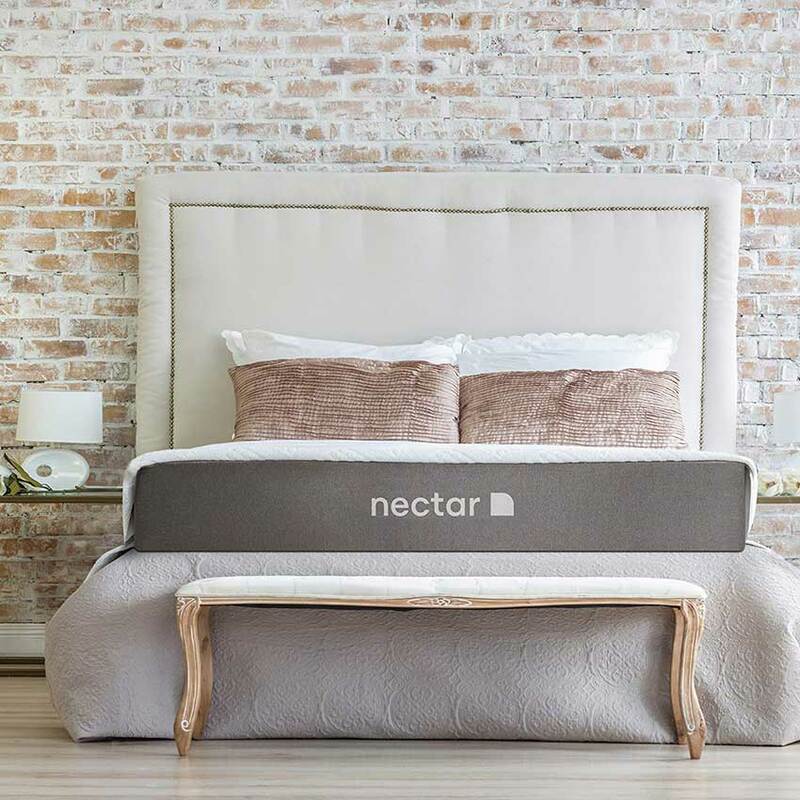 If you think the Nectar sleep mattress is for you then you need to click the button below and head to their website so you can read some more info and order yours.